← Matt Lauer is Soo Yesterday, Anderson Cooper is TODAY! I always try to buy black Barbies as gifts for my friends kids. It is extremely hard to find them. It is 2013 and the Barbie brand would be better with more diversity. It’s a shame they are taking so long. My daughter is 8 months and I’m sure dolls will be plentiful as she grows older. 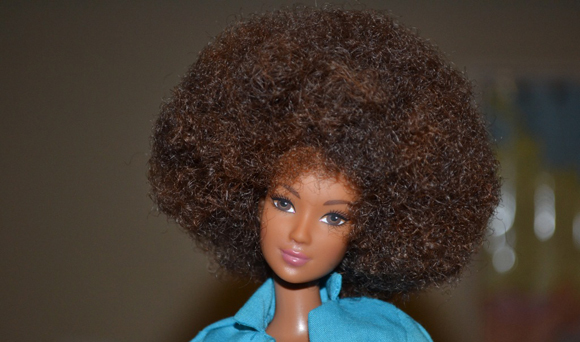 I myself had a lot of Barbies as a kid but not a one was black that I remember (aside from the Alladin dolls). I didn’t notice since it was “mommy’s complexion) but I notice now. Let’s add some of “us” to the Barbie brand. Exactly, if anything it would make the brand more profitable and realistic! I think it’s just plain sad that this issue hasn’t been addressed yet! I totally agree! What is even sadder? My own parents had the SAME problem finding Black dolls (including Barbie) when I was a little girl backintheday. *smh*(shaking my head) To hell with profits I guess..I know countless parents who would BUY. One other option? Hit them in the pocket! Which is what my parents did. Simply means do NOT buy Barbie products until they cater to folks of color and all races…Money talks or rather lack of profits does. Whenever my future grandgirls are born; they won’t be able to give me a Barbie doll for free! Pfft.. I agree! People need to protest and refuse to but any Mattel products until they start making Barbies of color. Additionally, not only should they start making more globally convoys Barbies, but Kens as well! The daftest thing about this is how they have regressed in time. They made them in every ethnicity you could possibly imagine and they were SO beautiful. Most of the girls in my school had one. If dolls like this were all over the place almost 40 years ago, what is going on in the 21st century? This is the first time I’ve ever heard of these Sacha Dolls, thank you so much for bringing them to my attention! And I agree, it’s definitely interesting to see the ways our country has gone backwards and become more racially segregated in a lot of ways! I hope Mattel becomes more globally conscious and starts to make dolls of all colors, shapes, and sizes!